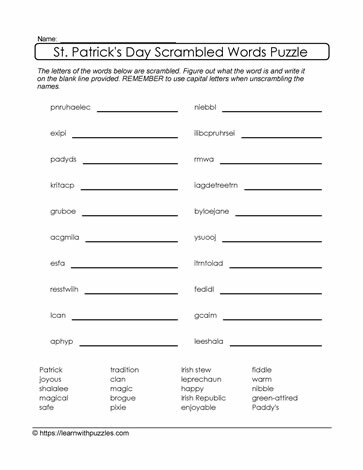 This St. Paddy's Day printable puzzle suits regular grade 3,4,5 classrooms and home schooling environments. Puzzles challenge and engage the brain, activate problem solving strategies, while making learning fun. Scrambled letters puzzle will also work in digital and Google classrooms supporting 21st century learning. Differentiate instruction for students in earlier grades and to support English language learners acquiring English. Ideas for using puzzles include: introduce a theme based unit about St. Patrick's Day; include jumbled letters puzzle in the literacy center, and as an added challenge, have students solve this puzzle without the benefit of the word bank.